"Sins of the Fathers, Part 1"
At the 2nd Time Around Shop, Raph is suffering through a game of “Shapester” (a legal approximation of “Twister”) with a very enthusiastic Mikey. As the game ends, everybody has a good laugh, though the jovial moment ends with the reminder that Splinter has been in a pensive mood ever since his rescue. As the Turtles continue their game, Splinter ends his meditation to seek a cup of tea. He is concerned about the return of Oroku Saki and knows that his foe will strike when they least expect it. Suddenly, Casey comes lumbering through the door, badly beaten up, and collapses on the floor. The Turtles help him up and he explains that his dad delivered yet another drunken beating. Enraged, Raph sprints out into the street toward Casey’s home, determined to deal with the scumbag once and for all. Splinter chases after him, brushing past April who is arriving with donuts for the gang. April sees Casey and is shocked at his condition. At Foot HQ, Karai succeeds in sparing with and defeating a trio of Foot Soldiers for the third time in a row. Her grandfather, the Shredder, commands her to repeat the exercise a fourth time. Karai has had enough and insists that she is ready to follow as his second in command. She reminds him that while Saki was dead and after her father had mired the Foot Clan in a tangle of bureaucracy, it was her subsequent leadership that returned the clan to its original strength. She had assumed command of the Foot and led them to victory against their enemies and, in fact, it was under her orders that Oroku Saki was brought back from the dead. Shredder scoffs at her statement, saying that he’d have killed her for her words on the spot were she not his granddaughter. Still, Shredder is willing to humor her and tells her to select three Foot Soldiers and attack him to prove her worth. Karai and her Foot Soldiers attack and Shredder beats them all in an instant. He declares that Karai is far from ready and, while looking over a shuriken, decides that he’ll have to find someone more suitable for the position. At the antique shop, Casey finally decides to tell April about his abusive father. April is upset that he’s only now telling her this story, as she thought they were too close to be keeping such secrets. Casey apologizes and asks for some aspirin. At a mysterious facility, Baxter Stockman wakes up in an examination room. Stockman recalls being drugged by General Krang and decides to sneak out. As he lurks through the halls, he spots a unit of Rock Soldiers heading to formation at Sergeant Granitor’s orders. Stockman continues to lurk about and finds a strange room. In it, dozens of squishy, pink, brain-like creatures are being held in stasis tubes. 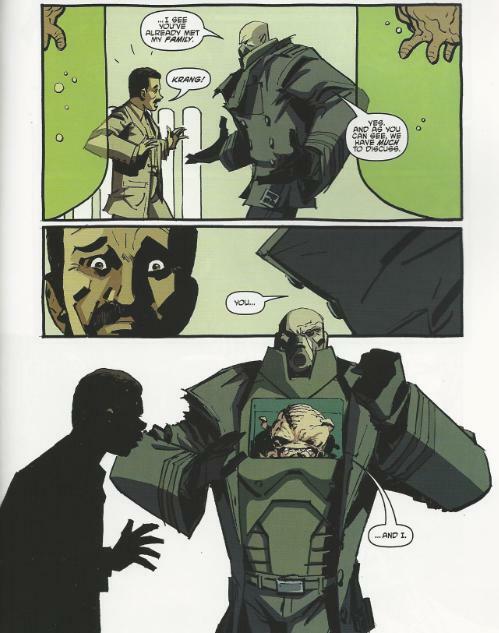 General Krang then approaches Stockman and reveals his true appearance (one of the brain-things) for the first time to the doctor. Krang then tells Stockman that they have much to discuss. 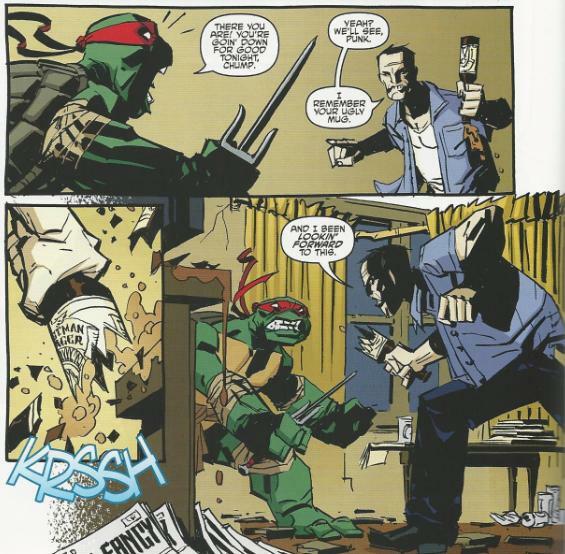 At Casey’s house, Raph comes bursting through the door and begins walloping the drunk (who recognizes him from their earlier encounter). 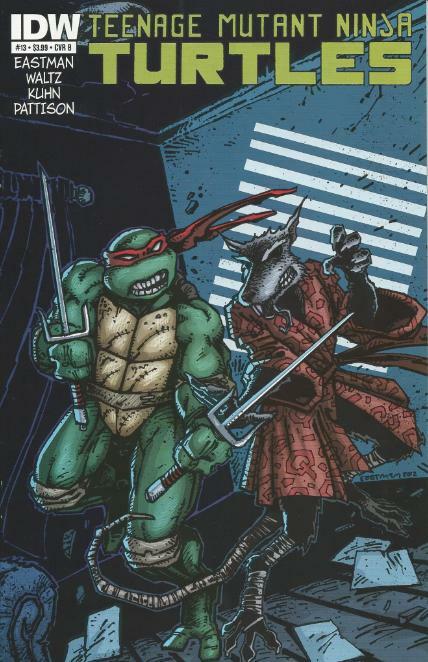 Raph is about to strike a killing blow with his sai when Splinter intercedes, seizing the weapon from his son’s hand. Splinter then holds the sai up to Mr. Jones’s throat and tells Raph that he will show him the “true way” of the ninja. 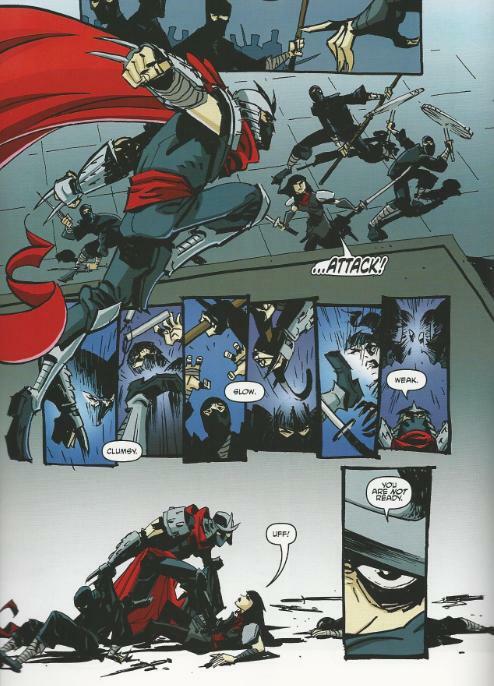 *This story is continued from TMNT Microseries #6: Casey Jones. The story continues in TMNT (IDW) #14. *Raph previously trounced Casey’s dad in TMNT (IDW) #2. *This issue was originally published with three variant covers; Cover A by Kuhn, Cover B by Eastman and Pattison and Cover RI by Valerio Schiti and Claudia SGC. I have to say, I was really surprised to see this issue pick up pretty much right where the Casey Jones microseries left off. A nice bit of planning and forward thinking, as most of the microseries up until now have been isolated adventures that fit between certain issues of the ongoing, but not nearly this snugly (the Splinter microseries not-withstanding, of course). It’s also a pleasure to see so many of the plot threads that have been lingering for a year finally get shifted into drive. We learn a little more about Karai, the Foot Clan and Saki’s return from the dead, but more importantly, we take perhaps the biggest step in advancing the General Krang arc since this freakin’ title began. Firstly, though, the Foot stuff certainly seems interesting. I don’t know how Saki could be Karai’s grandfather if he was alive in Feudal era Japan, but I’m sure that’s a question that’ll be addressed in time (perhaps Saki lived for centuries before meeting his demise?). I’d kind of like to learn more about Karai’s incompetent father and Shredder’s progeny, as a detailed history on the timeline and inner workings of the Foot Clan is something no TMNT continuity has ever really delved into. The upcoming “Secret History of the Foot Clan” miniseries will hopefully address those concerns. Also, Shredder’s looking for a new second in command, huh? Hun would, of course, be the obvious choice, but maybe Waltz will throw us a curveball and make it Tatsu? Ha! Just kidding. An original character would be likelier than that. Anyway, I suspect Krang is going to be retroactively made an Utrom in this series, which is a pretty intuitive maneuver. He was originally designed after them in the Fred Wolf cartoon, after all, so making him one of their race would be coming full circle (the 4Kids cartoon kind of already did the same thing in the “Secret Origins” episode, though it was more an Easter Egg gag than anything serious). Or maybe he won’t be. I dunno. At any rate, I’m absolutely chomping at the bit to see more of Krang and the Foot Soldiers, so this storyline can’t move fast-enough for me. The Turtles’s part in this issue wound up being the least interesting, as it so happens. Not a surprise, as villains tend to be far more exciting to read about than the protagonists. The “shocking” cliffhanger seemed a bit excessive; like Waltz needed something surprising to go out on and we’re given this pretty transparent false alarm. Like Splinter’s actually going to kill the guy, right? Maybe I’ve just been reading comics for too long, but cliffhangers for the sake of cliffhangers are a small peeve of mine. Your mileage may vary. What you’ll probably notice right off the bat with this issue is that it was drawn by Dan Duncan’s replacement, Andy Kuhn. Kuhn had previously penciled the Michelangelo microseries, and I don’t want to be a Debby Downer or anything, but he is the only artist that IDW has utilized whom I haven’t fully liked. He’s certainly improved since the Michelangelo microseries, but his improvements have only been in regards to the amateurish mistakes that littered that issue; such as scale and perspective. It’s a relief that Michelangelo isn’t 4 feet wide and 8 feet tall anymore and characters no longer look like they’re standing on completely different planes and axis when they should be in the same dimension as one another, but those were mistakes a pro artist never should have been making in the first place. I’m afraid his style just isn’t to my liking. The way he draws the faces of the Turtles is absolutely ridiculous; they cannot CLOSE THEIR MOUTHS. 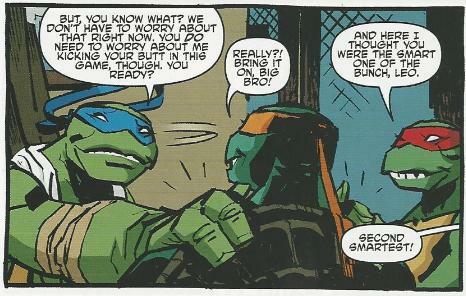 They’re always making these idiotic grins and contrary to whatever the dialogue may tell you, the result is that the Turtles look silly in even the most intense situations. And I don’t know if those are huge cheekbones or dimples or what, but they aren’t helping. What Kuhn succeeds at most is human faces and figures. The entire sequence with Karai, Shredder and the Foot Soldiers looked great with excellent layout, body language and facial expressions. Likewise, the sequence with Stockman creeping about the facility corridors and confronting Krang worked to his strengths and the guy draws a terrific Krang, both in robot body form and brain form. It’s just the Turtles I can’t stand, and even then, it’s how he renders their faces. They’re just goofy and dim-witted looking, like how a parody artist would draw them for MAD Magazine or something. I think Kuhn’s skills would be better served on Microseries or what have you that center around the human supporting cast and limit the use of the Turtles-themselves. Because as a regular artist on the TMNT ongoing, where he has to draw the Turtles quite a bit, I can’t see myself getting over his style. I generally try to be supportive of the creators on these books, but I’m not going to like every artist; that’s just the way it is. Anyhow, it was really just the art that brought this issue down for me and perhaps the shallow cliffhanger gimmick at the end. I’m still psyched to see these storylines unfold and the more Krang the better. Good call-out on the pseudo-cliffhanger at the end. I hate that storytelling gimmick that feels like you have to put a "To be continued" tagline to make sure that people buy the next issue. OK, I know that, even with the logo in the comics, this series is not related with nickelodeon (only because they have the rights) but... Didn't you feel some Princess Azula vibe in Karai in this issue? The cliffhanger was made all the less cliffhangery by having the cover for issue 14 directly parallel to it. On one page we see Splinter holding a sai to Arnold Jones' neck, the next we see him with Sword drawn and Arnold Jones' frightened reflection in the blade. Even though we all knew that Splinter probably wasn't going to kill him having it revealed in the cover art on the very next (and visible) page was not the way to leave me excited for what might happen next months. Plus having the sword scene visible at the same time as the line the true way of the ninja, makes me just want to laugh that perhaps the true way of the ninja is to kill them with a sword and not a sai. I know that's probably just me but the layout of the book took an already weak cliffhanger moment and totally flushed it down the drain. Other than that great to see Baxter and Krang again, glad they weren't forgetten. Also you made me realize an interesting thing when you typed "an Utrom" its a word that starts with a vowel but shouldn't have the "n" added to the a before it, you would just say a Utrom despite it going against all of the established laws of grammar. After that I was at a loss to find any words in the english language that also broke that mold. Thanks for the brain workout! Really glad to see you're back Mark, especially in time for the new IDW issue. I hope that your move wasn't too taxing and you are settling in well in your new home. Oh hai, they showed blood being spilled in this issue!